Hey guys, random DIY mod here, just wanted to share. I ordered fog lights and a trunk lip spoiler from eBay last week, but I'm still waiting for them to arrive in the mail... so since I was bored today and couldn't wait to start modding my car, I decided to try something that I've wanted to do for a while. 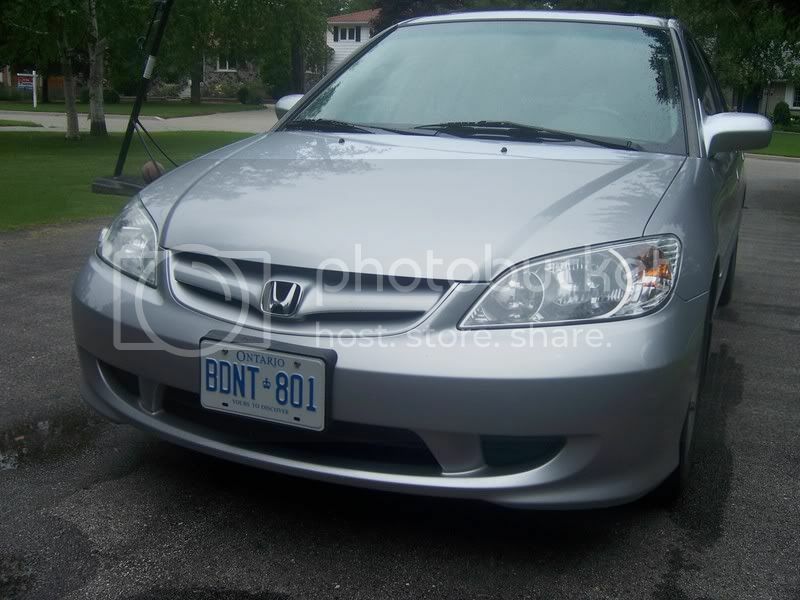 I painted the surrounding edge of the grille on my 2004 Civic Si sedan BLACK! Before: I never liked the plain solid silver look, mostly because it looks JUST LIKE every other freakin' silver DX/LX/'Special Edition' Civic on the road, so I decided to give my Si a little custom appearance. I didn't want paint it completely black, because then it might look like I just bought a stock, black grille and put it on my car. 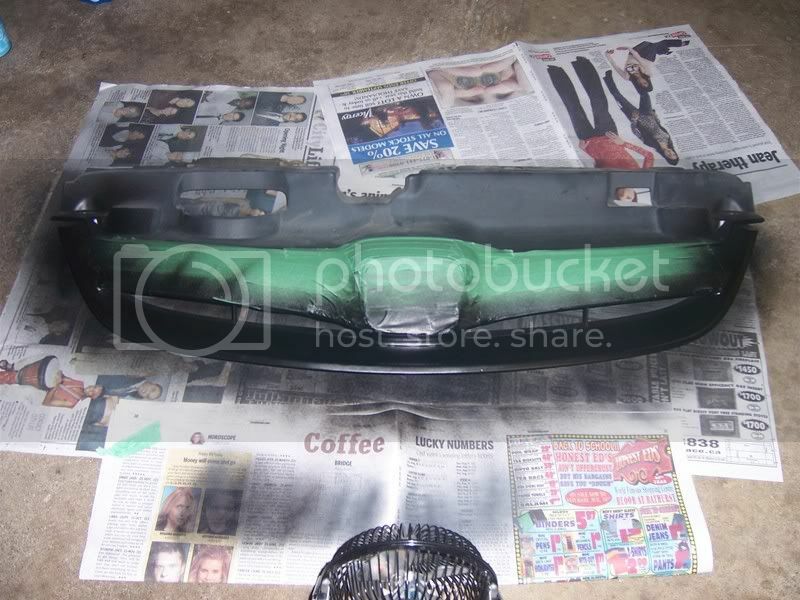 I applied two coats of black primer and 4 full coats of 'universal black' automotive spray paint from Canadian Tire ($11). I ran out of clear-coat so I will be getting some tomorrow. TIP: For anyone thinking of doing this mod, be sure to paint the plastic part that comes down from the bottom of the Honda logo. If you don't, your grille might look like it has a body-colour 'growth' coming out from under the logo, and it will ruin the clean look of the 'floating' middle bar. Also, be sure to spray fully around the edge of the grille, including the under side, so that you hide the seam with the bumper. RESULTS: I think it the 'floating grille look' works really well! Almost Acura-ish, without the blingy chrome. I thought about buying a Civic coupe grille, but I didn't really want to spend the money and I don't like the woven pattern design, and I also didn't want to try to 'fool' other drivers by making my car look like a coupe (not that it matters at all). Primarily I just wanted my car to be unique and custom-looking, without being ricey or weird. I have another cool mod up my sleeve, related to the HID's and my headlights, once that package arrives I will DEFINITELY post a DIY with lots of pics. P.S. 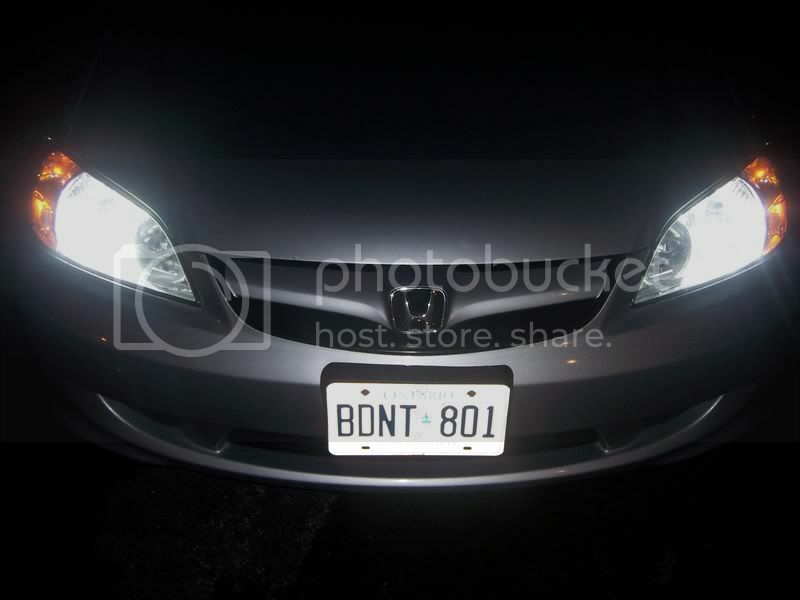 I got the conversion HID's from Brendan ([email protected]), and they are awesome! Not as good as a retrofit, but a quarter the cost. Last edited by kamandor; 10-Aug-2008 at 09:07 PM. I like it!.. looks good! Wow, looks nice. Makes me want to do that mod on my wife's Si. cooool.... hrmm my car is black already.. sooo for me to make it look floating.... id have to paint it what colour???? I would paint it a gunmetal gray/silver, don't do it straight silver because I think it would look too bright, almost like fake chrome or something cheap. I'm thinking of repainting mine a gunmetal colour, I think it might blend in better with the silver. I love the black, and I will probably keep it black for a while, but I'm just thinking of different ideas for the future. Looks very nice, different from the other grills you see out there. Hey guys, I bought a trunk lip spoiler for my sedan and I didn't realize when I ordered it but when I put it on my trunk the spoiler covers over the top of the tail-lights. I'm just wondering, has anyone seen any Civic sedans with a trunk lip spoiler? I'm not sure how to mount it, or whether I should trim the spoiler (its made of rubber) to make it fit between the lights. I'm thinking I could just put it over the tail-lights, screw what people think, and maybe even paint the top of the tail-light that is on the trunk so that it 'disappears'. Just wanted some opinions, thanks!!! Last edited by kamandor; 13-Aug-2008 at 10:31 AM. Thanks! Although I knew how long the spoiler was when I ordered it, I didn't really think about what it would look like when I mounted it. I'll probably just cover over the tail-lights, I don't really care that much. I just didn't want to buy the typical 'standard' Civic spoiler, with the LED third brake light. I think they look stupid and over-sized. I want a more subtle, subdued look, and I think the lip spoiler will achieve this. P.S. 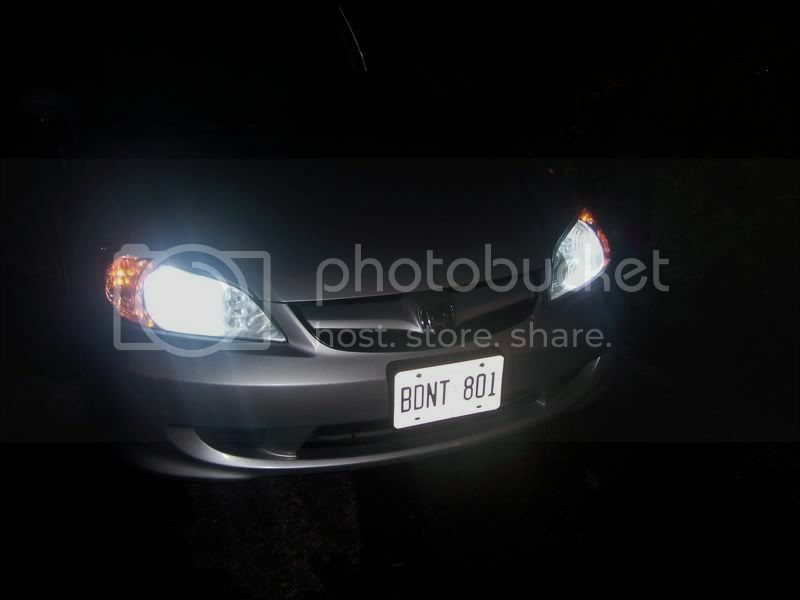 My eBay fog lights work PERFECT, I installed them last night. hey kamandor, i was reading your other post about the grills. I cant find it right now so thats why im posting here. sorry mods. but heres an idea for you about your grills. 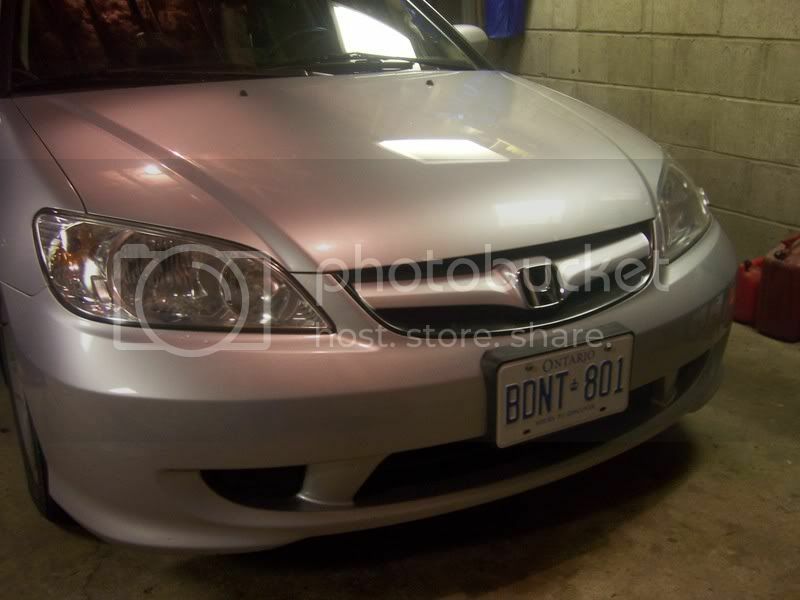 Quick Reply: Blacked out my front grille - 04 Si Sedan - pics!